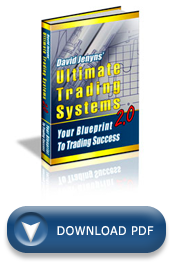 A well-designed trading system is useless without the tools to implement it. However, choosing the best charting software, or deciding whether to use one at all, can be very confusing for a newbie trader. This is especially true when you consider that there are literally hundreds of software packages available to assist traders. You don?t need to spend thousands of dollars paying for good, reliable charting software. Often the price is inflated to capitalise on the belief that the more expensive the software, the better. Longevity. Look for a package that?s stood the test of time. There are plenty of packages on the market, but some of them are here today, gone tomorrow. There?s nothing worse than taking the time to learn a new piece of software only to find it?s no longer supported, since the company that developed it has gone down the corporate drain. Large user base. Choosing a package that uses a large, established user base and is supported by well-attended forums will mean that if and when you need help, there will be plenty of support channels available to you (outside the developers themselves). What?s more, there are great new discoveries made by the community that the developers may have never even thought of. Flexibility. Your package should have plenty of flexibility for coding so you can easily define your entry and exit criteria. Avoid packages that are so pre-programmed that you really don?t have any control over what they do. Market scanning ability. A good charting software package will have the ability to quickly and accurately scan the market for securities exhibiting criteria you define. Back testing facility. Choose a package that has a back testing facility within the charting package itself, or one that is at least compatible with a well-established back testing package (further discussed in chapter 9). Independent data plans. Beware of software packages that force you to use their data. They may be offering you the software cheaply ? or even free ? but then they tie you into their (often expensive) data plans. It?s best to find a charting package that has third party independent data plans. And finally, if you?re still having trouble selecting between a few different packages be sure to ask about trial versions. It?s a great way to see if the package is right for you. No matter what charting software you do decide to go with, it is important to recognise that software is simply a tool that aids a trader in undertaking her business activity. Beware of software packages that do everything for you. These are commonly referred to as ?black box systems?. Black box systems are typically computer programs in which the system spits out recommendations based on hidden pre-programmed logic. The problem with these types of systems is that you don?t know what?s going on behind the scenes, you just get a list of buy and sell recommendations, without any explanation or understanding of how they?re created. They?re not tailored to the individual and, in my experience, simply don?t work. In general, traders who believe the myth that you can just hand over your hard-earned capital to a computer program, sit back and collect cheques, are living in a fantasy land. Sure, they want to make the money successful traders do, yet they do not want to put in the hard work necessary to develop the skills needed to become and stay successful.Your time and money is best spent elsewhere. The charting software package I use is MetaStock – www.ultimate-trading-systems.com/charting. MetaStock?s formulas are based on popular spreadsheet programming language so if you can use Microsoft Excel you?ve already got a good head start. Its exploration module gives the user the ability to scan through tens of thousands of securities at once, identifying only those that meet predefined criteria. MetaStock has a fantastic back testing add-on and doesn?t force you into any specific data package. While I do recommend MetaStock, there are some other packages worth looking into: Advanced Get, OmniTrader, SuperCharts, AmiBroker, Market Analyst and TradeStation. I?ve heard good reports about all of these packages but haven?t used them in great detail. Whichever package you choose, take the time to learn it inside and out. When system designing, you don?t want to be limited by lack of knowledge. If you can conceive it, you want your package to be able to deliver it. No chapter on charting software would be complete without talking about market data. Yes, some software packages offer their own data feeds, but I suggest you look at third party data feeds because they?re usually more cost effective.Which data provider you go with will vary depending on which software and market you decide to trade. Do they support multiple markets? Although you will have selected only one market on which to concentrate, it?s important that you have access to data for multiple markets in case you decide to change markets down the track. Do they provide fast download and data distribution? Your time is far better spent identifying profitable trading opportunities than waiting for data to download. Choose one that downloads and distributes quickly. Do they provide automatic database maintenance? The effects of splits, name changes and additions will drive you crazy if you have to input them manually. Your data provider should be able to provide these updates for you automatically. Do they provide the ability to quickly and easily create custom folders? No matter what charting software you?re using, this is critical for enabling you to conduct more efficient analysis. It will save you hours of time in the long run. Is the data provider here to stay? Changing providers costs time and money. Select one that has a good track record and will be around for the long term. Want to see our preferred data provider? 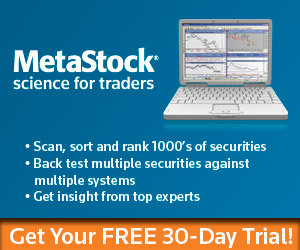 or grab a free MetaStock Trial here. Could not find ATR as an indicator on metastock. Is it called something different? Look for the indicator called “Average True Range”. #1. Yes MetaStock provides a Forex solution and you don’t have to use the quote center… check out http://www.equis.com for more info. #2. My expertise is with MetaStock so I haven’t really done much work with quotecenter or MetaTrader. It doesn’t really matter so much what you use, just as long as you have something in place. Thanks for the good work. Iam just wondering whether as a new trader do we really need a charting software. Think the Brokers always have one or two on their site. Hi Jide, it doesn’t matter where you get access to a charting package… if the broker’s platform gives you the charting functions you need – I say go for it. May I ask your opinion on software: “Stockfinder by Worden”? We use MetaStock… haven’t really tested many other in great detail. Can’t really comment on this one. Just follow the guidelines in this chapter and you’ll be on the right track. zenfire with ninjatrader is optimal for trading. I also like IB for data and trading platform, for beginner to intermediate. charting platform, WAVE59, is real nice too. but all the charting software and addons wont make you a successful trader. first begin with spotting the trend; is it going to make hier hi’s or lowr hi’s. or lowr high’s and lowr lows… which way is the market swinging? is the tide going in or out? then learn to spot support and resistance… can it go higher or not? third, look for the beginning middle and end of the up move or down move. Elliot Wave type stufff. and you will see the patterns with in the waves fighting for s/r to make the swing hi’s or swing lo’s ..